Lobularia (also known as Alyssum or Sweet Alyssum) is an annual flowering mounder from the Mediterranean region. It can be used as an edge plant in landscapes, as part of a combo basket as a cascading bloomer, or in a standalone basket or container. Lobularia Streams are part of Danziger’s breeding program and have been selected for their better heat tolerance and growth habit. For best results with Lobularia, we recommend using a constant feed program of 100-200 ppm N with an EC of 1.2-1.4. Maintain a pH between 5.5 - 5.8. 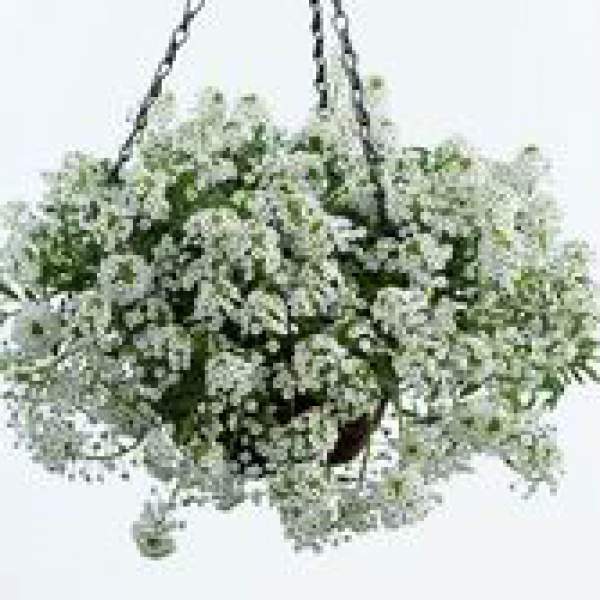 We recommend that you pinch Alyssum White Stream once 10 days after transplanting and roots are well established. Lobularia should be spaced adequately to allow airflow and light penetration between the foliage. Usually 2’ centers on baskets will be enough. Lobularia are responsive to PGRs, but maintaining a high light intensity and proper pinching are the preferred methods for controlling stretching. Aphids, whiteflies and possibly thrips are the primary pests attracted to Lobularia. Alyssum White Stream are susceptible to fungal growth when their growing environment is too wet. Watch for botrytis, leaf spots, stem blights, and root rots while the days are short. These problems are usually associated with oversaturation of the soil. You can prevent them by allowing the plant to dry out between waterings, allowing for good airflow in your greenhouse, and spacing to allow the sun to penetrate to the soil level. The most common chemicals used to treat fungal infections are Medallion and Banrot. Use them as a drench according to each label’s instructions. We recommend that you pinch Alyssum White Stream once 10 days after transplanting and roots are well established. Place in full to partial sun for proper growth.